By WITCH PRINCESS - I had work to do, so you're welcome! Well, today marks my first day of publishing short stories each week on Friday. As I said before, I should have enough time in between to come up with new ideas, because I'm that creative. Without further ado, I present to you Witch Princess and the Potion, which stars only me. Don't worry, fellow staffers! Next week will be your time to shine! I mean, is Ludwig's story from Rio de Janeiro the only one on here so far? ...Enough of the questions! Let's begin! The Witch Princess was just that: both a witch and a princess. Of course, as with all magical deities, she had powers. However, she couldn't just resurrect you from the dead. Even if she could, why would she waste her precious time on that kind of spell? It's pretty hard to cast as is. Anyway, Witch usually listened to farmers who dare crossed her path. Be wise with your choice of words, though. Praise the Harvest Goddess and you'll be turned into a frog. Or worse, you'll become one of her many teddy bears! It all depends on how much she hates you. Don't believe the story? Yeah, she really does turn people into teddy bears! If you ask Witch what she hates most about her job as a mischievous deity, she'll tell you it's annoying, dissatisfied farmers. You know the ones. Specifically, they're the ones who become so irritated at the princess that they get on her bad side. It is very frustrating, indeed. Witch can recall an incident where one farmer made her so angry that she now lives in the spellcaster's house as a statue. It all started when the farmer entered the spooky-looking woods, hoping that the Witch Princess would grant her a special potion that would make her crops grow faster. She saw the Witch as a last resort, because the Harvest Goddess didn't make potions. She walked up the eerie staircase past the dark, foggy pond in front of the enchanted house. Not knowing what to expect, she knocked on the door. A pair of red eyes looked into her own. The door opened. Inside was the one and only beautiful Witch Princess! She smiled, a bit smugly. "Need some help? I've got plenty of potions! Why, over here I ha—"
"I need one that will make my crops grow faster, please." The farmer already had her eye on a few things. "Perhaps I have something like—" Witch thought, looking around. "Here it is! I found it!" "Okay, let me just have a look at what's in your hand..."
The farmer clutched the potion she had just found tighter in her hand. "I'm sure this is the right one. Are there any bad side effects with this?" The Witch snickered. "Well, knowing me, maybe! But seriously though. That's one of my newest creations and I have no idea what it's going to do..."
The farmer rolled her eyes, and then spoke. "But will it work?" "Alright...I'll be sure to bring you whatever it is you like in return for the potion." The farmer left Witch's house, happy with her enchanted item. "Aheh....heh..." Witch laughed as she shut her door. What was she thinking? Dumb farmer...I'm the mischievous Witch Princess! Of course that potion contains bad side effects! Who am I, the Harvest Goddess? Pffft!" This is an accurate depiction of Witch's face after the farmer left. The next day, Witch was enjoying her morning eating ice cream with her teddies. Nothing could get better than that to the spellcaster. After breakfast, another farmer approached her home. He complained about how the Harvest Goddess was nagging him to restore the land. He wanted to pull a prank on her, just to have some fun. Witch laughed, and gave him the potion he needed to ruin the deity's day. The farmer smiled, left some of his crops from the current season, and left. The farmer from yesterday came storming into the house, looking red as a tomato! She started to point her finger at the princess. "Well, you're right. I'm a witch. But what did I lie about?" "THIS POTION RIGHT HERE! YOU SAID IT WOULDN'T HAVE BAD SIDE EFFECTS!" "I said no such thing, dear. I said I didn't know." The Witch tried to remain as calm as possible. ".....That's just...fine!" The farmer smiled, though Witch could tell she didn't mean it. "I'll just never come here again!" Witch shook her head in annoyance. She thought she had heard the end of it. But the farmer still had a lot of harsh words. "Compared to the Goddess, you're not that great...really. Why do people even come to visit? So they can pull pranks with you? Honestly, you're no help to the valley." 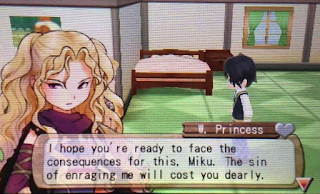 Okay, now that was the final straw for the Witch Princess. Her eyes were flaming red with anger. "Hee hee...I'd hate to be you right now!" The Witch cackled and cast a spell on the farmer, turning her to stone. While the girl was motionless afterward, she still had a surprised look on her face. The princess had a huge grin on her face. "I'm sorry you feel that way. Maybe next time, you should think about what you say to me! I can be your friend," she snickered, "or your enemy! Now then, where should I put this statue?" From that day forward, there stood a statue in the deity's room that warned those who visited not to get on her bad side. If you think you've won the battle after that, think again. Seriously, I'm warning you! And there you have it! The first short story! Let Witch know if you'd like a sequel to this, otherwise she'll write more stories with the rest of the staff here! Either way, it's no problem. See you next Friday! 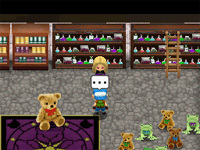 If you need some background information about Witch Princess, click here for her welcome article. Do you plan on having regular commentators as cameos? Hadn't thought of that, but good idea! God I wish every article lacked Ludwig. Great read! Do mentions count as lacking Ludwig? Just take over the site and forget about him. 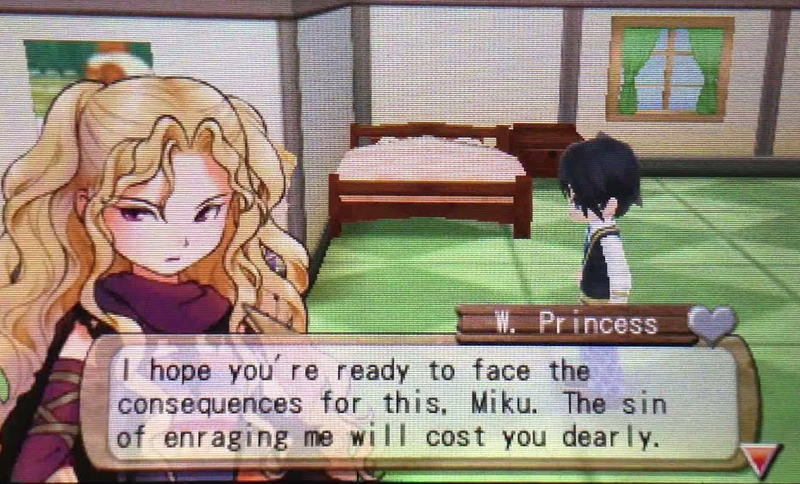 If there is a sequel to this, I think it would involve the Harvest Goddess attempting to prank you back for lending the other farmer the potion. this story reminds me of Medusa, but in a "not-villan" way,i liked the tomato face part, overall the story is nice and I'm ready to read more of your stories.